The unit allows any vehicle with 4 cylinders or less (motorcycle, ATV, mini sprint, etc.) to have quick shifter functionality without the need for a Power Commander. This new stand alone unit allows any vehicle with up to 4 coils to have quickshifter functionality. Featuring our latest INTELLISHIFT TECHNOLOGY this unit provides the smoothest shifts of any stand alone unit on the market. With enhanced algorithms this unit staggers kill times per cylinder and for different RPM ranges delivering faster, smoother, safer shifts than ever before. Also now has end user adjustability. If needed you can now adjust kill times per RPM band and adjust the shift sensor activation point. 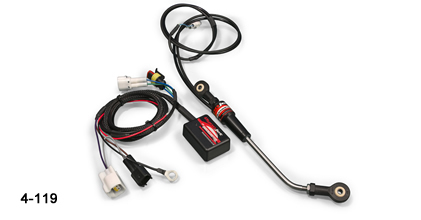 This Ignition Quick Shifter comes with Denso coil cap connectors for easy installation on many late model motorcycles. For applications that do not have this style of coil the connectors can be removed and the unit hard wired in. This unit has spade terminals aalready installed and will work on all applications with up to 2 coils that utilize spade terminals. Harness comes with the necessary connector to plug Dynojetquickshifters directly in. This unit utilizes adaptive shift technology for seamless shifts at both low and high RPM. Works great for all those older model bikes still on the road that want the benefits of a quickshifter! 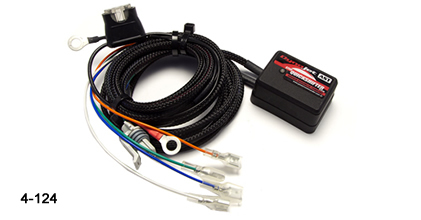 This unit comes with “coil cap” style connectors for easy installation on many late model Ducati motorcycles. For applications that do not have this style of coil the connectors can be removed and the unit hard wired in. This unit allows any single cylinder vehicle to have quick shifter functionality without the need for a Power Commander. 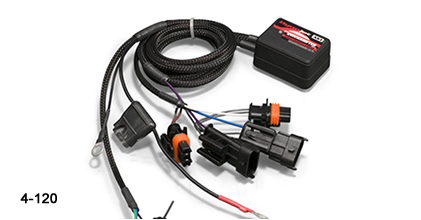 It comes with “coil cap” style connector (Denso) for easy installation on most late model applications. For applications that do not have this style of coil the connector can be removed and the unit hard wired in. 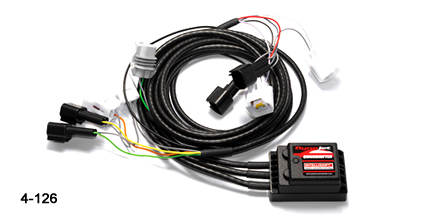 - Long travel sensor designed to keep unit away from riders boot and from the bikes chain. - Sensor is fully waterproof and immune to temperature. - Optional remote quickset adjuster allows you to adjust kill times on the fly.